Almost everyone in the family returned home to Penang for Grandma’s funeral and prayers. It was the rare occasion when everyone was in one place – having meals together, going places together – just being together. Now that the children are working elsewhere, we rarely ever meet. Aunties and uncles spend more time with their own expanding family. Mom and dad with us. I missed those times of being together as one big family. It was almost festive-like last week. Even though the main reason was for a funeral, it was the one thing that brought us all back together. In a way, Grandma had always been the one reason everyone got together. We spoke of all the old days, living in the big kampung house in Alor Setar, of Chinese New Year eves together (we rarely do that nowadays with the family scattered all over the place), ‘pai thnee kong’ (prayer at midnight on the 8th day of the lunar New Year by Hokkien folks) nights when the kids got to stay up late, yummy dishes Grandma used to cook, the graffitti us kids drew on the walls of the old house and the never ending line of dogs we used to have… those are precious memories. The kids are all grown up now and earning good lives away from home. But it is not the ability to jetset or buy that latest ridiculous gadget or that new dress that is in season that will give us eternal joy. The things that really matter are usually free but priceless – and my family is on top of that list. 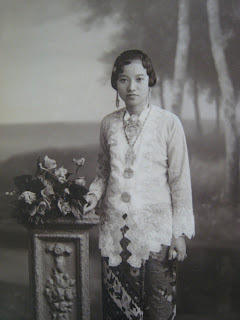 My beloved grandmother (mommy’s mother) passed away last Friday. It is such a devastating loss to all of us. Ah Mah had been the centre of all our lives for as long as I could remember. We are still grieving the loss, but hold the memory of her dearly within our hearts. I always consider myself the most fortunate of all grand-daughters to be able to have grown up in the shelter of her abundant love and affection. She was the most generous and kind person, and touched the lives of many many people beyond our own family members. I will always miss my Ah Mah, and pray that she is now happier and even more blessed. It feels as if these few months, fate is trying to test me. First, I had to go through my miscarriage and try to be strong while hubby couldn’t come back in time, and now I am feeling so so so crappy, being sick and coughing my guts out – home alone again. It’s not that hubby doesn’t keep me company, but I just had to fall sick when he already made plans to return home. On top of that, I am really worried about my dear grandma who is now in the ICU in a critical condition, and the earliest I can return home to be with her is on Friday. I am stuck in a situation at work where it is just impossible for me to leave before Friday unless something really really really bad happens. Bad things are just falling on me at all the wrong moments. To kick it off, dinner out tonight. Yippee…. With hubby back at home, dinners at home are now longer and less lonely :P. While for two weeks, whenever I ate at home, those were quickie dinners and quieter too. But for the next 3 weeks we can have dinner as a family – just the 2 of us. 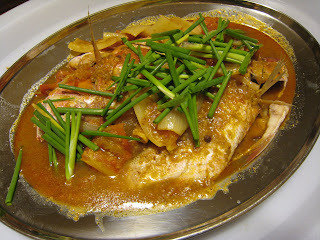 Tonight, I decided to steam the ‘ikan merah’ that I bought last week from the market. On work days, nothing beats pre-packed sauces; and tonight I feel like some spicy sour nyonya curry sauce. You can get those from any supermarket and grocery shops, my favorite brands are Uncle Sun’s and Good Mum. For that little extra touch of home, I simmered the sauce for a little while with onion wedges, one diced tomato and a stick of lemon grass. 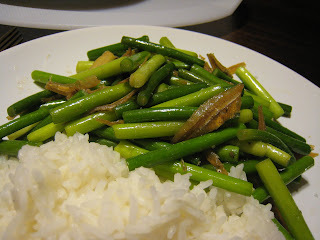 Plus, a side vege dish sauteed with garlic and ‘ikan bilis’ (anchovies). Eating at home sure saves you some money…RM3 for the sauce, RM4 for the fish, RM2 for the vegetables…not even ten bucks! I remember waking up feeling calm and excited all at the same time. And filled to the brim with happiness! Then, my aunty came through the door, carrying the most beautiful bouquet. She promised me they would be special for me, and they were….every single petal was perfect! The fresh orchids for my hair! Aunty and I went to get those from the market a day earlier and they bloomed fresh and lovely. Makeup artist Mandy did a great job. I always liked this picture, of my daddy so tenderly putting up the final touches to my door. My friends had wanted to make the guys eat a whole bag of bananas…. I remember vividly the moment I saw the ballroom for the first time before the banquet. I remember being choked with emotions, and thinking how absolutely beautiful it was! The colors, the flowers… it was amazing. I remember at that exact moment, I thought to myself.. our wedding is going to be perfect! Our emcees for the night – Angeline and Beng Hooi. Their opening words touched us deeply – thank you, you two! I am feeling sad tonight. Coming Up: Our Wedding Anniversary! Our first wedding anniversary is coming up in 2 weeks! Wow… I can hardly believe it is now nearly a year since we tied the knot. And the best thing is, we will be in Penang on that day. What a pleasant coincidence ! Back to where we started…. When I was in KL this week, Wid and I went engagement ring shopping on behalf of a guy friend of ours who is currently stuck offshore and could not do it on his own. Anyway, with a certain given budget and specifics for the ring (that lucky lucky girl!! ), Wid and I found ourselves in Tiffany and Co. and Cartier. While we couldn’t deny that Tiffany and Co. had the kind of ring with the BLING factor that he’s looking for (slightly over budget but what the heck…. ), we weren’t exactly impressed with their manners and customer service. We were out of there within 20 minutes. Then we dropped by Cartier just to have a look at their range and found ourselves stuck there for nearly an hour. For starters, the sales person was extremely nice and helpful, and most of all made us feel very comfortable being there (I mean, hey… it is not as if Cartier is our everyday shopping destination!). She gave us options, showed us different ideas for proposal to bring back to our friend and started a friendly chit chat with us. So if you are indeed considering dropping by Cartier KLCC, do look for Maybel. And then, it caught my eye! It was a necklace with a pendant of two inter-twined rings in 18-carat rose gold. Simple, ridiculously priced… but oh so LOVELY! Sigh…..
P/S: We decided the engagement ring from Tiffany and Co. would give him that BLING factor that he wanted for the fiancee-to-be (again, luckyyyyyyyyyyyyyyyyyyyyy girll!!!). Cartier KL does not stock engagement rings. One has to order it off a catalogue from Singapore, or drop by Cartier Singapore.